This lightning strike in eastern Nevada was captured by my field assistant Jehren (https://www.flickr.com/photos/jehren/) during a trip to our research sites. During monsoon season these events are quite frequent at the upper elevations. Besides wildfire, one of the most significant natural hazards risks for sensory installations in mountain environments is lightning. Direct hits are not necessarily required to incur electrical damage, especially if the design of the equipment is such that the circuitry is somewhat sensitive. Electromagnetic pulses (EMPs) are associated with lightning events, and these sometimes powerful fields can damage individual semi-conductors or circuitry inside electronic devices which are not designed for this eventuality. 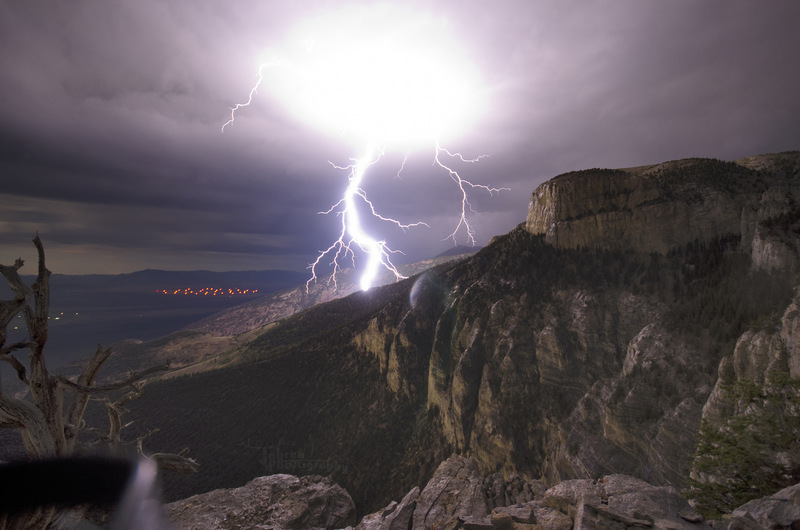 Mountaintop radio communications engineers have known about lightning protection since the early days of wireless communication. Indeed, early scientific experiments with lightning-related static discharge can be traced to Benjamin Franklin in 1752! Results of Franklin’s work led to development of grounding protection (the “lightning rod”) for houses, ships, and other tall objects. We still use these principles today to protect our field systems from arcing and unwanted electrical discharge. A very thorough history of the development of lightning protection is this Federal research report. In general, the idea for direct strike protection is to provide a direct, low-resistance path to earth ground from above or around your equipment. If the impedance of the path to ground is too high, arcing of the electrical current to a less-resistive path will occur, along with associated damage. Very often, it is the actual interface with adequate earth ground that is the most difficult problem (if there is little soils development, or lots of rocky terrain). In these cases, many copper ground rods distributed throughout the site and all connected with lots of large bare copper wire in a mesh is the best solution. You can never have too much grounding material! Making your equipment appear to be electrically-indistinguishable from the surrounding terrain is the goal. You can never have too many ground rods or mesh wire connections. 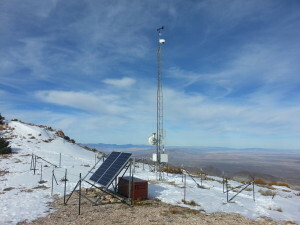 This mountaintop station has copper grounding rods at each corner of the enclosure, along with 3 at the tower base and another 2 at the solar rack. All of the framing and metal infrastructure is tied together and to this grounding network with large-diameter copper wire which crisscrosses the site on the bare ground. In addition to external grounding, you also want to have protection on the actual distributed wiring and circuitry on your research site. It is totally possible for high transient voltages to appear on long runs of wiring/cable simply because of a near-miss and associated electromagnetic fields. You goal, again, is to channel that transient energy to ground just like a direct strike. There are many devices out there that are designed to do that, usually under the label of “surge suppressors”. There are these units from Midnite Solar, designed for DC Solar applications, as well as line protectors that are interface-specific (for example, RS-232, Ethernet, or RF coaxial). Campbell Scientific offers single-conductor suppressors for wiring going to sensors and the like. Placing these various items in-line with your field wiring can partition off transient voltages or even direct strikes and save part or all of your equipment. If you decide to install science electronics in an environment which is prone to seasonal lightning strikes, you cannot afford not to implement as many of these suppressors as possible. I like to place one suppressor at each end of a long cable run if I have to distribute wiring more than a few feet across a site. 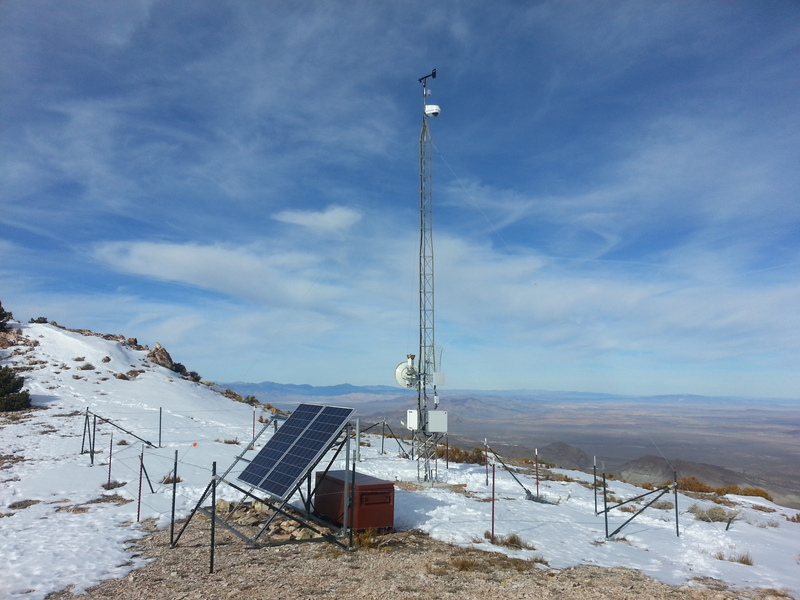 In the second part of this topic, I’ll show the results from a direct lightning hit on a mountain sensor deployment. We’ll see where the damage was done, what survived, and what didn’t. Photo credit: the lightning photo on Mt. Washington in eastern Nevada was taken by my assistant Jehren Boehm on a trip to work on our field sites in the Snake Range. Yikes! And epic photo, Jehren.